Innovative applications using IDF® CHiKPRO™ Chicken Protein continue to lead the trend for bodybuilders, athletes, and fitness fans—now with new Real Clean Protein Powder from BarnDad™ Nutrition, coming to the Mr. Olympia Fitness & Performance Weekend, September 14-17 in Las Vegas. 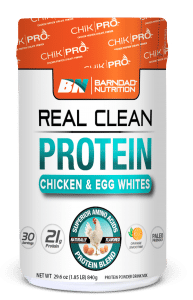 “Real Clean Protein Powder is built on chicken and egg whites—two of the most bioavailable and efficient protein sources on the planet,” said BarnDad’s David Hawk, former Mr. World and Mr. USA, supplement expert, and trainer. Stephanie Lynch, Vice President of Sales, Marketing, and Technology for IDF, calls the new protein powder a natural extension of the growing list of clean-label products formulated with IDF’s real chicken ingredients. Real Clean Protein Powder is available in Chocolate and Orange Smoothie flavors. Get complete nutrition information and other details online at BarnDadNutrition.com. The Mr. Olympia Fitness & Performance Weekend features bodybuilding and fitness competitions, demonstrations, celebrity appearances, and major exhibits by hundreds of fitness-industry organizations. For details including BarnDad Nutrition booth location and scheduled events, visit mrolympia.com. CHiKPRO™ Chicken Protein Isolate Powder is a patent-pending technology.